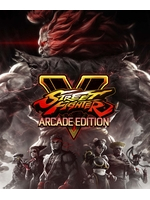 Capcom has unveiled Street Fighter V: Arcade Edition, a new updated version of their fighting game. Set to release on January 16 2018 for PC and PS4, it will include Arcade Mode, Extra Battle Mode, new V-trigger moves, Gallery, a redesigned UI and the DLC characters from Season 1 and 2. Those fighters will be downloadable via a redeem code included with the game. Current players will receive the other new features for free through an update. hah, Two P from Final Fight in shot no2 with the barrels bonus stage. Capcom loves Final Fight. I do too! I'm happy this is finally real. So much for not having multiple releases of the same game. Knew they couldn't help themselves. This is a patch. They didn't change their stance on that at all. This is your "definitive edition", not a new game (like SSF4). No KORNdog is right, it will be an update minus the DLC characters for SF V owners but this arcade edition will be a separate release (£39.99). No shame:). The only thing they promised is that "sfv will be the only disc you need to play the game with future changes". And the gameplay stuff will be a free update, just like every other patch. They never said anything about the multi-release thing. All the things not coming from Capcom are just misinterpretation of the game media. I have no problem with this. It's just an updated package including all the updates and characters. They aren't forcing you to buy a new game or fracturing the player base. There's literally nothing to complain about if you already own the game.